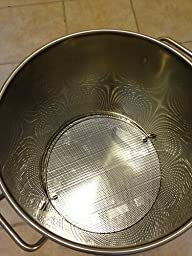 The false bottom collapsed on the first use (just 20 pounds of grain). I’ve contacted Bayou Classic via email and phone, and managed to get ahold of warranty spport at 800-864-6194. I’ve sent them an email with a photo, and my Amazon order information, and they’re sending me a replacement. 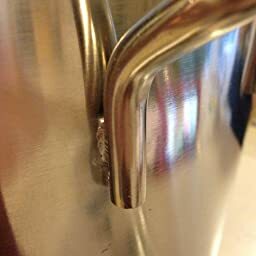 I agree with second Nathan’s observation on the quality of the stainless steel fittings. One of the couplings that were included couldn’t be used with any of the 1/2 NPT stainless hardware that I have, *except* that which was included. I ended up using my own coupler. I would highly recommend getting a roll of *yellow* PTFE tape. It’s double the thickness of normal white plumber’s tape, and is safe to 500*F, and costs exactly the same. 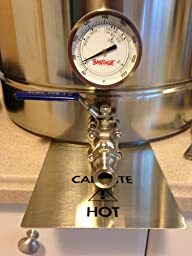 I would highly recommend getting a dip tube with this kettle, given the height of the ball valve. I bought one for side pickup from BargainFittings, and it fits great. I had a bit more trouble adjusting the dial thermometers. 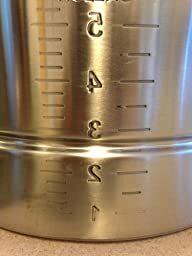 I bought two kettles, and adjusted both of their thermometers to match the reading on my Thermapen in lukewarm water. Both were off by 2-3*F by the time the water was boiling, and the thermometers had time to adjust. 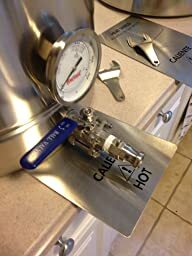 I would not trust the thermometers for mashing, so I bought a Taylor Digital Panel Mount Thermometer which I’ll use to get a more accurate temperature reading. Also, neither of the two false bottoms I received were perfectly flat. 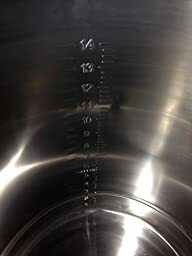 After a test brew, I’ll see if the grains escape around the edges, or if the weight of the grain creates a good enough seal around the edge of the false bottom. Eye-balling it, it looks like it shouldn’t be an issue. 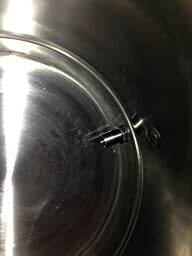 Cons: The ball valve threads and threads on the adapter going through the pot, are pretty rough. I used the entire mini roll of Teflon tape included with the pot, yet the valve remained loose, intermittently dripping. You may need to dig out your own roll of tape to have on hand when you put yours together, since the valve threads need to compress tight. 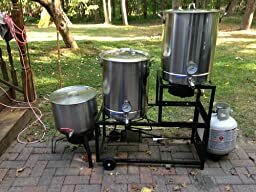 The valve is pretty high from the knuckle of the kettle, so you’ll have to do a fair amount of tipping to get all the precious wort out. The nuts and o-rings need to be very tight when mounting the valve adapter and the thermometer. This is a bit awkward with the small wrenches provided. 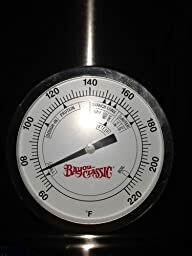 Pros: The big thermometer gauge is easy to read and can be seen from quite a ways away (…useful for those mid-winter brews when you just want to check on progress from inside where it is warm.) 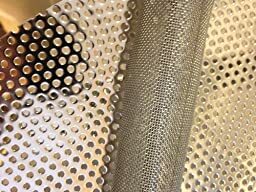 The tri-ply base is nice for dissipating heat across the bottom of the pot without creating hot spots. (I didn’t have any LME burn down, though I left the burner on for a few seconds when I dropped the malt.). 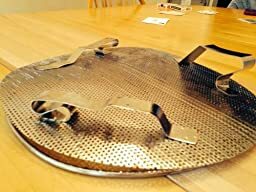 Tips: You may need a paddle for this, as it is a deep kettle. Tighten everything up so there is a log of pressure on the o-rings. 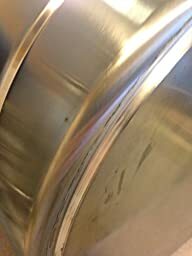 There is residual machine oil on the valve and false bottom; you may want to have a degreaser handy. 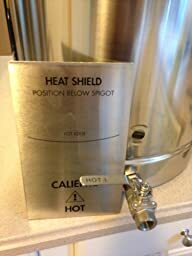 The directions say to set your thermometer off of one you already own and trust, I brought water to a boil, and easily adjusted the thermometer to that temp. For this price you’ll have a hard time finding a SS kettle with all these extras. Only issue I’ve found is that the bulkhead fitting has a very teensy drip when I have a full pot. Of course, it could have been from my subpar plumbing skills. Probably could have used a little more Teflon tape and fixed the drip. But really the drip is so small I’m not going to mess with it. Everything else is top notch and I’m glad I saved some money instead buying one of the more expensive kettles on the market.